Joes defend title to create history. Under-19 Division I Cricket Final. St. Joseph’s won the Inter School Under-19 Division Cricket title at Reid Avenue on Friday. St. Joseph’s created history when they retained the Inter School Under-19 Division I two-day tournament cricket title as Dunith Wellalage produced decisive performances with both bat and ball to disappoint S. Thomas’ in the final at Reid Avenue on Friday. In winning the title the Joes became the only team to have defended the title and denied Thomians a grand double. S. Thomas’ were the winners of the Limited-Overs tournament early this week and were looking to win a second title. In reply to S. Thomas’ 216 runs, the Joes were precariously placed at 60 for four wickets at one stage on day one. That was when Dunith Wellalage dropped anchor to guide the team. He scored ten fours and one six and had faced 104 balls when he was out for 88 runs. He had a decisive fifth wicket stand of 70 runs with Dineth Jayakody and a sixth wicket partnership of 62 runs with Sachintha Mahindasinghe. When Lakshan Gamage was out bowled by Kalana Perera, the Joes were still behind (218 for 7). That was when Rupasinghe provided assistance with a crucial 25 runs stand with Wellalage. When Wellalage departed (243 for 8) he had gained the first innings advantage for Joes. Daniel chipped in with an unbeaten 11 runs. was also the main wicket taker for St. Joseph’s when he took five wickets to contain S. Thomas’ who had amassed scores of over 500 runs in the last two matches. 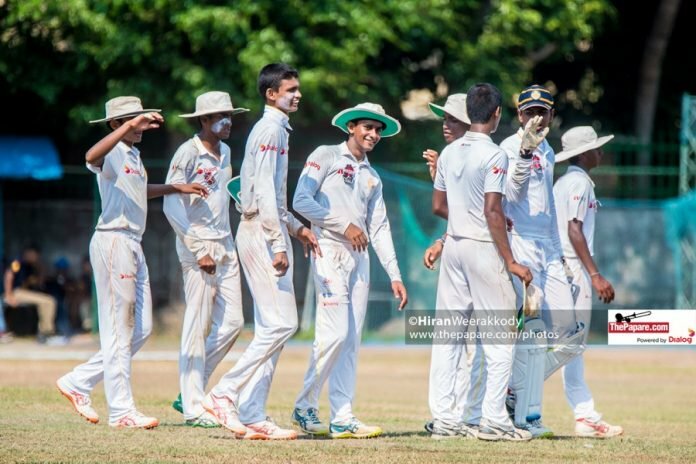 The quarter final and the semi final matches of this tournament were decided on the Sri Lanka Schools Cricket Association had insisted that the final be decided on if the teams failed to go for an outright victory. The Thomians batted for a second time and reached 67 for two wickets before the teams decided the first innings result.